We have a brand new Anything Goes themed challenge at Crafting From The Heart. 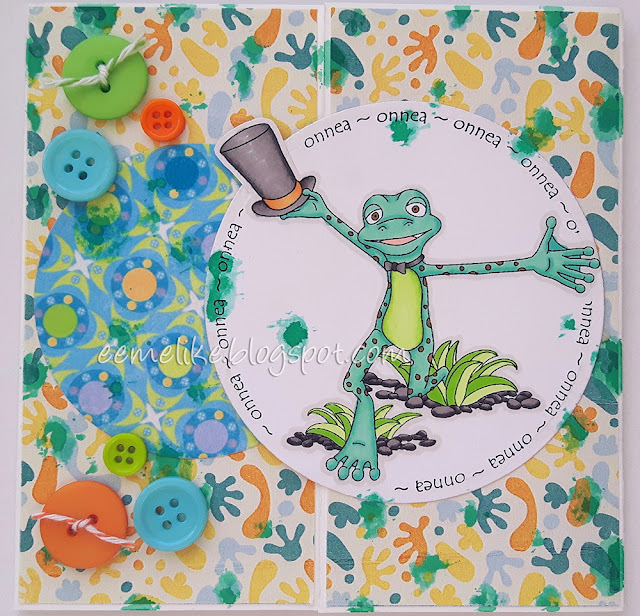 The cute image, called Ta Da Frog, is from our this week's sponsor Scrapper's Delights, and I colored it with ProMarkers (listed below), a FlexMarker (Bright Green) and a Spectrum Noir (GB10) marker. Before printing I added the sentiments (Onnea = Congrats is Finnish) with MS Word around the image. Meillä on uusi Mitä vain -teemalla varustettu haaste Crafting From The Heart -sivustolla. Suloinen kuva, nimeltään Ta Da Frog, on tämän viikon sponsoriltamme Scrapper's Delights 'lta ja väritin sen ProMarker- (listattuna alla), FlexMarker- (Bright Green) ja Spectrum Noir - (GB10) tusseilla. Onnea-tekstit lisäsin kuvan ympärille MS Wordilla ennen sen tulostamista. Designer paper is a digital one from Queen Wild Scraps and the smaller piece I grabbed from my stashed scraps. Some splashes of ink with lucky clover Distress Stain. Circle dies are from a Spellbinders set, card is gate-folded and for finishing touch I added different sized buttons with a little bit of baker's twine. Kuviopaperi on Queen Wild Scrapsin digipaperi ja pienemmän nappasin silppulaatikosta. Musteroiskeet on tehty lucky clover -sävyisellä Distress Stainilla. Ympyrästanssit ovat Spellbindersin setistä, kortti on porttitaitoksella varusteltu ja koristuksina tällä kertaa erikokoisia nappeja sekä hieman puotinarua. A great card, I love all of the colour in the background and the image is gorgeous. 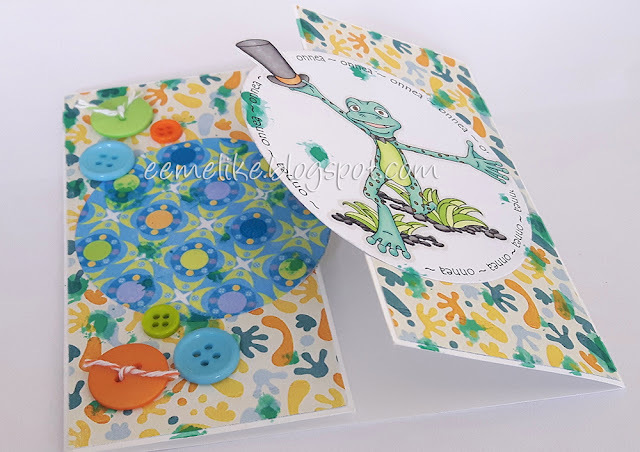 TERRIFIC frog card and a lovely shape.